When we think of a New Year we think of resolutions…and organization. They go hand in hand like champagne and New Year’s! It’s only natural to want to begin your new year with a fresh start, and often that begins by getting our homes organized. Capitalizing on this almost instinctive motivation Jodie and I are getting straight to work. 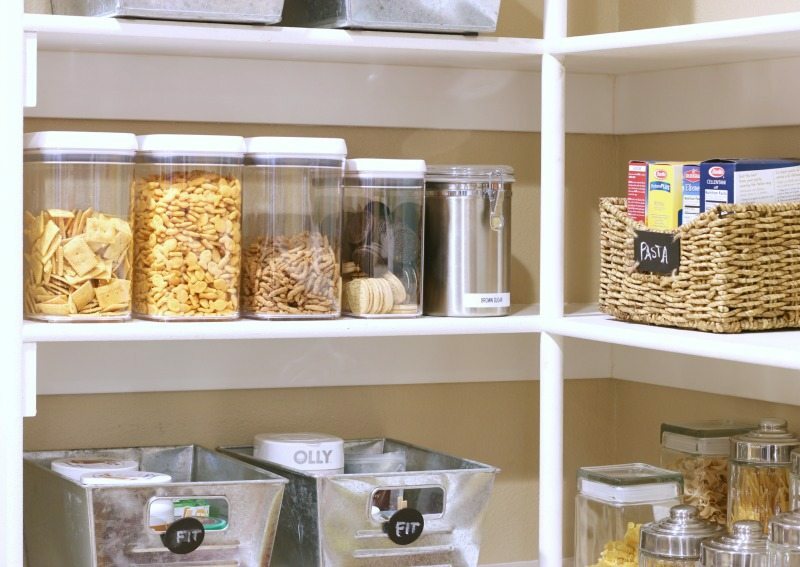 Today we are going to show you an important reorganization project: The Pantry! 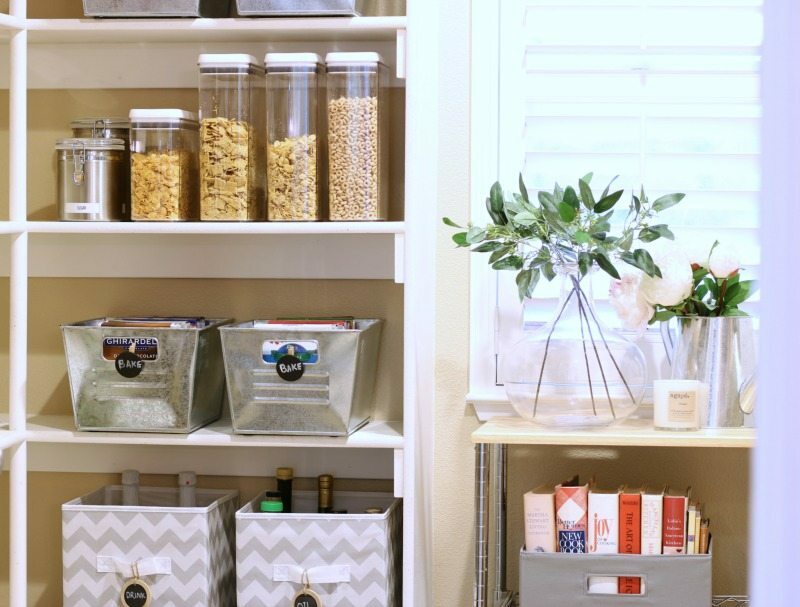 Using our step by step tips and tricks plus perfect product suggestions we are going to show you just how easy it is to create an organized pantry! 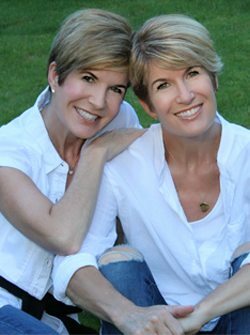 Jodie and I are SUPER excited and honored to now be part of the BHG Live Better Influencer Network for 2018. We are compensated when sharing our favorite finds from Better Homes & Gardens at Walmart. As always our opinions are our own. Affiliate links for product sources are included for your shopping convenience. 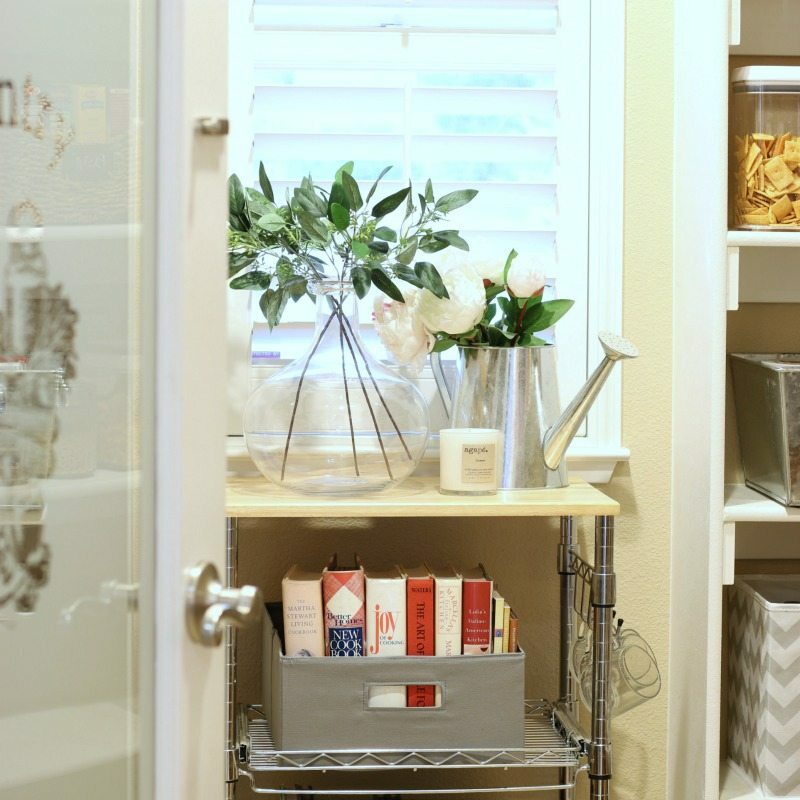 To enjoy more affordable organizing solutions from the bloggers at the BHG Live Better Influencer Network click HERE. Here’s a quick peek at what Jodie’s pantry looked like before. You might think, wow, it’s great! (and it totally is!) It’s HUGE and fabulous. However, with the size comes unique challenges, the main one being that everything but the kitchen sink tends to end up in here. 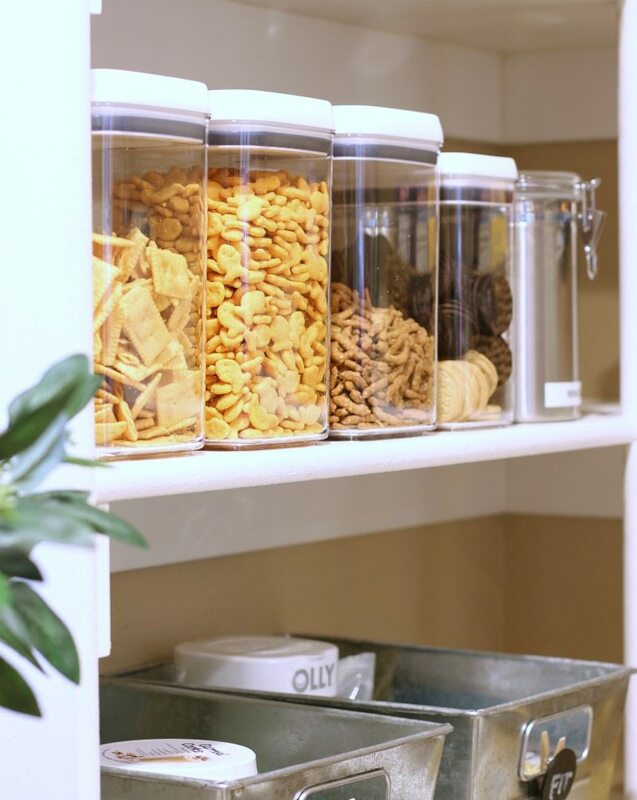 It became increasingly obvious last year that her pantry needed an overhaul. 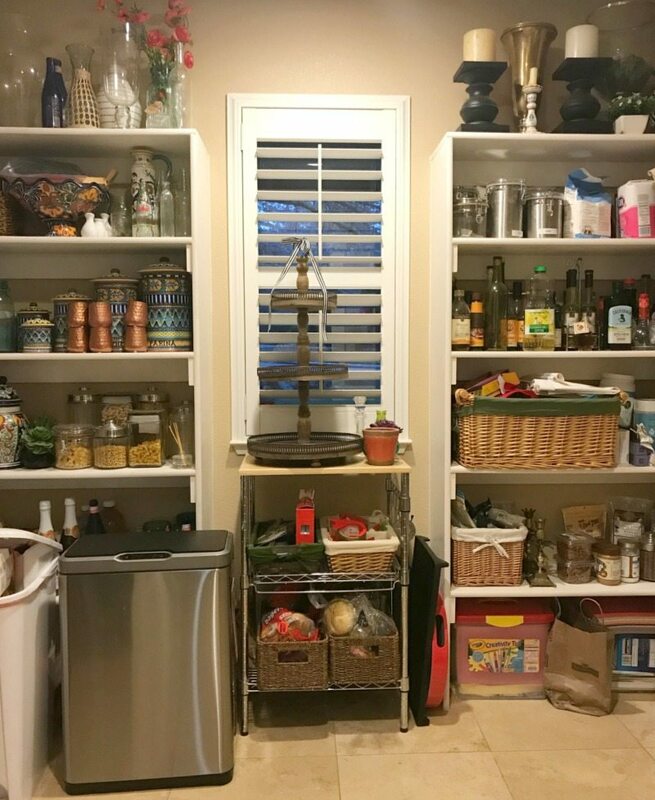 No matter what the size of your pantry this hub of family activity is a common challenge spot and therefore a great place for us to start our New Year Organization. Organize into piles. Put like items together so you can see how many you have. This is important so you can decide how many you really need in each category. Go item by item and ask yourself if you really need it. If you haven’t used it in a full year get rid of it. Continue until you have made it through everything in your pantry. Now that you can see all that you have you are ready to PLAN your organization. First, decide if all the categories belong in this area based on space available and daily use. Next, determine if everything will fit and how. You may decide at this point to get rid of more. Now, imagine what types of storage containers would work best based on space and type of items. Take measurements of shelf space etc. Now is a good time to visit Walmart.com where you will find a huge (and exciting) selection of solutions. This will help you in the planning of your space. 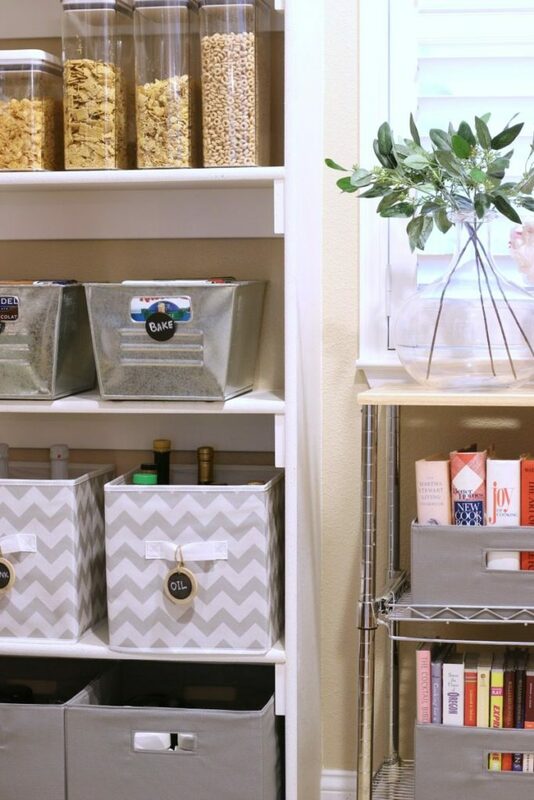 Now that you’ve organized, decluttered, visualized, measured and planned you are ready for to shop! while in your space you can go back and forth visualizing, measuring etc. 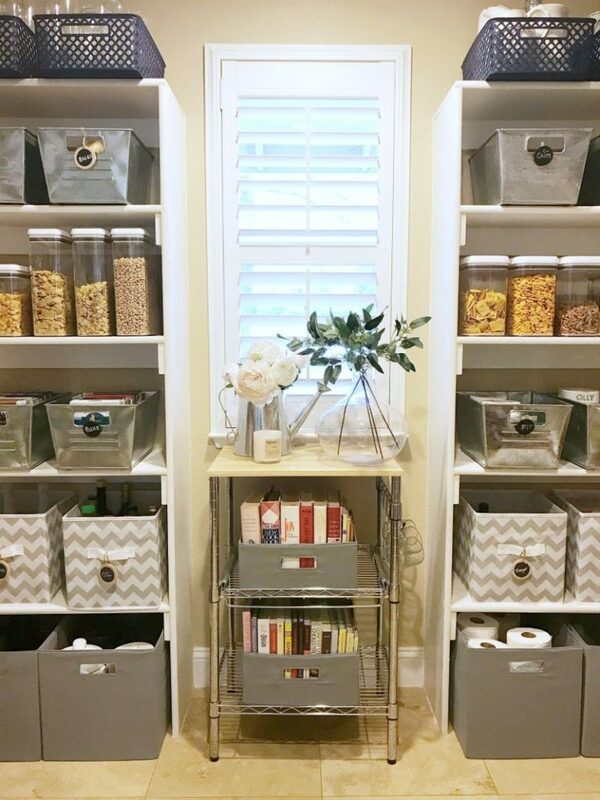 Gray Fabric Storage Bins – I used these for floor storage because of their large size. They are perfect for items like paper towels, water bottles and any bulk items. 1/2 Size Gray Fabric Storage Bins – I used these to display my collection of recipe books. Plastic Flip Tite Food containers – These are perfect for food items like cereal, cookies, crackers and nuts. They are especially good if you have kids! They solve the problem of poorly closed boxes and stale food. If you buy in bulk these are fabulous. If you haven’t bought in bulk before these will help you start! Good for you, the environment, and your pocketbook! Small Galvanized Bins – I used these for small pantry items like pasta, rice and baking supplies. Labeling your bins and containers is always a good idea, especially if the container is opaque and the contents can not be seen easily. It’s also a great way to achieve “compliance” from family members (and visitors) to keep things organized! I used some small wooden chalkboard tags to label my bins and containers for easy access. Chalkboard tags are a great idea because they can easily be changed if you decide to move things. They are also easy to find at your local craft store. An old fashion label maker is still easy to use, inexpensive and can add a fun retro flare. Gift tags that match your color scheme can be attached by a small piece of twine or a small clothes pin. Cut and make your own out of card stock or recycled cards. Punch with a whole punch and add a fun ribbon. Start by making the background pretty by adding self-stick wallpaper, contact paper or painting. Next, consider using a pretty contact paper for the shelves. Choose a color and/or style theme and carry it through all your design choices. Make sure you have opaque containers for the items that you want to hide. If you want to show off what’s inside use clear containers. For my project I chose gray as my theme color and decided to include a small pop of navy blue. I chose a gray chevron pattern to add a bit of interest. As you can see I used mostly opaque containers –I wanted to hide all the messy looking stuff!! you can opt to match your kitchen color scheme, etc. Hide things that will tend to get messy with use. Put kid snacks where they can reach them. Put things you don’t want the kids to reach hidden and/or out of reach. Place heavy items in spots that are easy to access. Give a final consideration to balance, colors and aesthetics to really make your project shine! 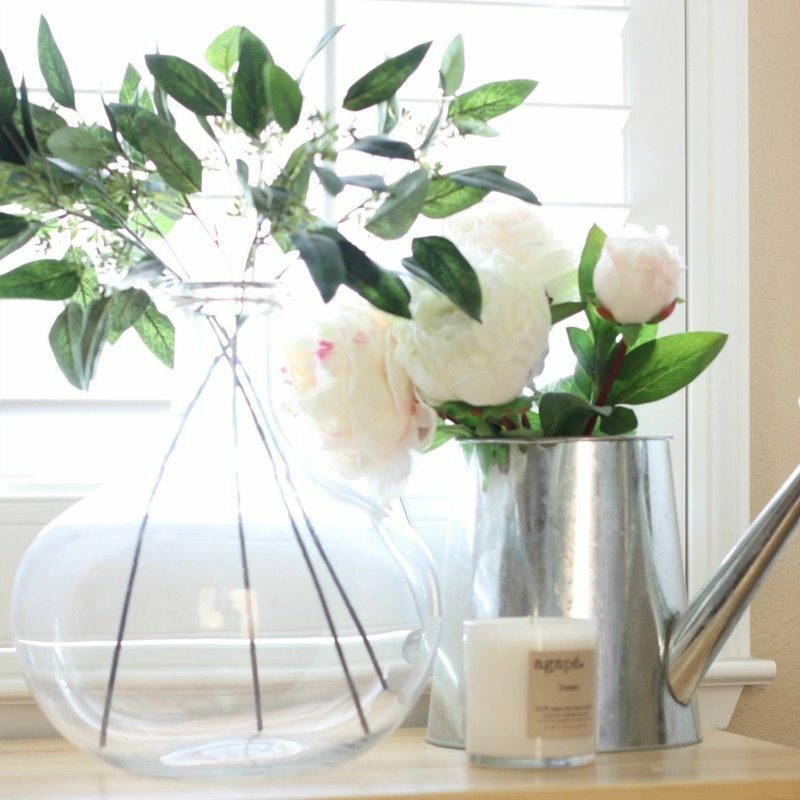 For my pantry I decided to keep the small cart counter top for purely aesthetic purposes and brought in some faux flowers, a galvanized watering can (that matches the galvanized theme), a glass vase and a pretty candle. I love having candles in here in case the garbage ever has an odor. Isn’t it amazing what a difference a bit of natural beauty makes the overall look? Pro Tip: Even in a functional space it’s always worth saving a bit of space for decor. The prettier it is the more motivating it will be to keep it that way! Now it’s time to congratulate yourself and show it off to the family. 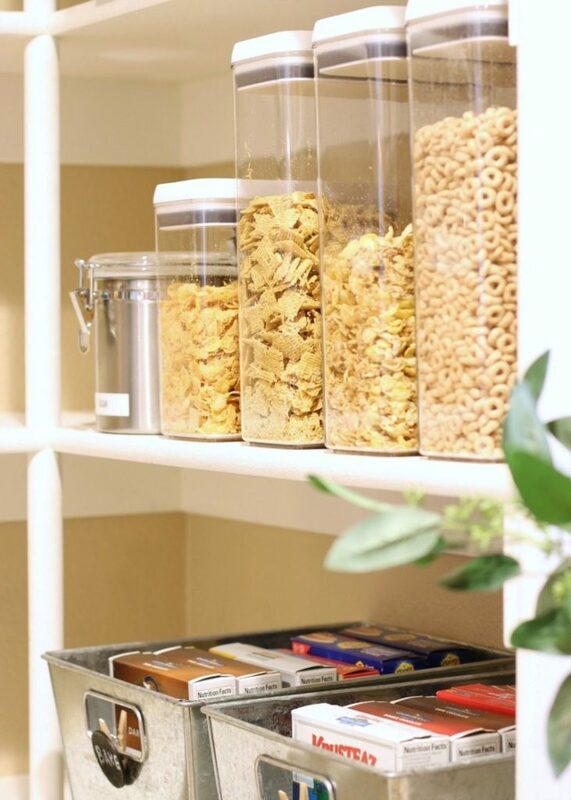 Be sure to give them “a tour” of your new organized pantry, so everyone knows where things belong. It’s a team effort to keep things organized. 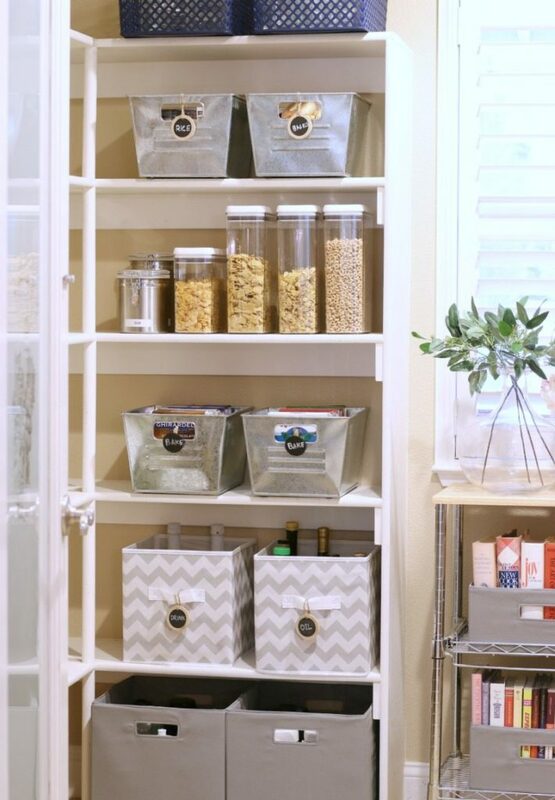 If everyone is on board you’ll have a much better chance of your new organized pantry staying that way! 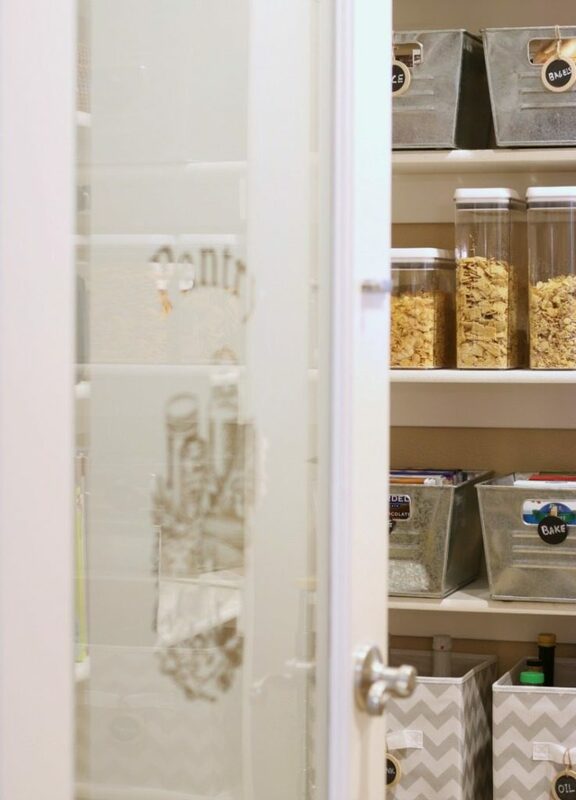 How good does it feel to have an organized pantry? We know, right? It feels amazing!!! Well, we recommend using this success to motivate you to continue…onward and upward, Friends! You can use this same step-by-step process for all your storage areas: closets, cupboards, even drawers in you home. Pro Tip: Make an organizing calendar and set a goal to organize one area a week. Can you imagine how great you would feel? The more you do the easier it gets, even addictive! Now we’re talking about a great transformation! You’ve got this! Leave us a comment and tell us how you do! We can’t wait to hear about your successes. Jodie and I would like to say a special thank you to our friends at Better Homes & Gardens at Walmart for partnering with us for 2018! We will be bringing you a new challenge every month as part of the Better Homes & Gardens Live Better Influencer Network. You can find the Better Homes & Gardens brand line carried exclusively by Walmart. 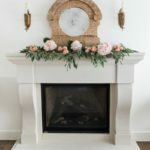 Follow BHG on Facebook, Instagram, Twitter, and Pinterest. 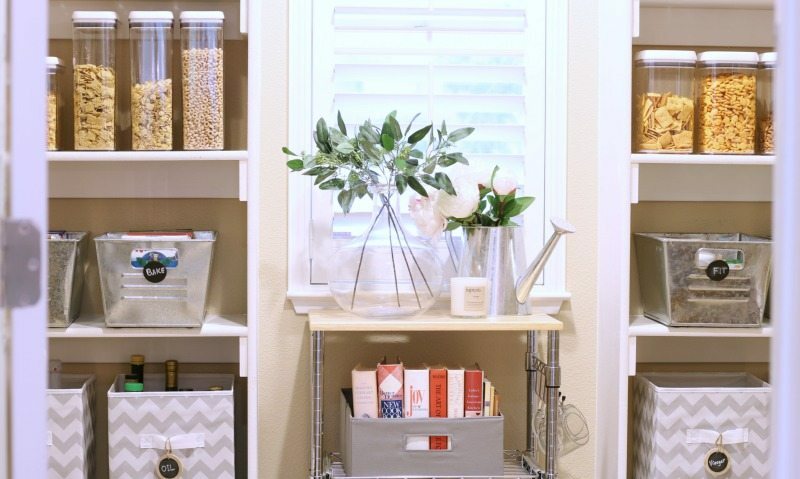 Have you caught a bit of the “organizing bug”? Good! It just so happens that we have friends who can help you continue! 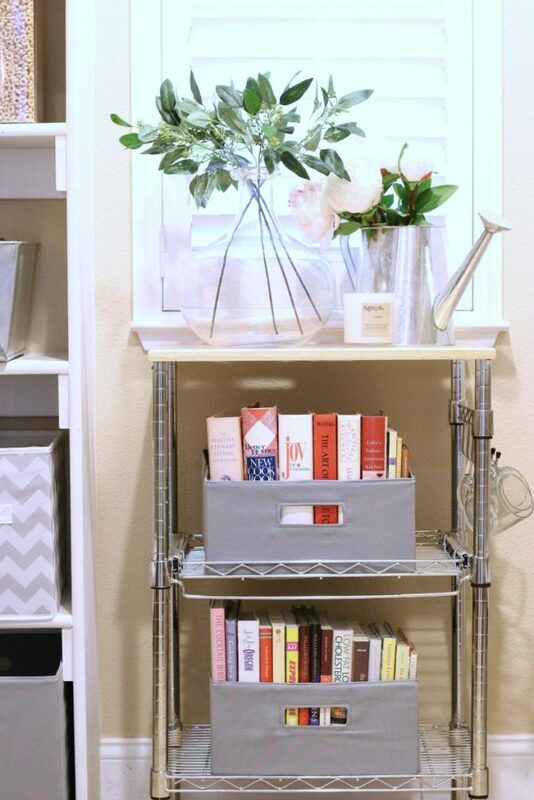 Check out these other fabulously inspiring bloggers and their organizing tips and projects! 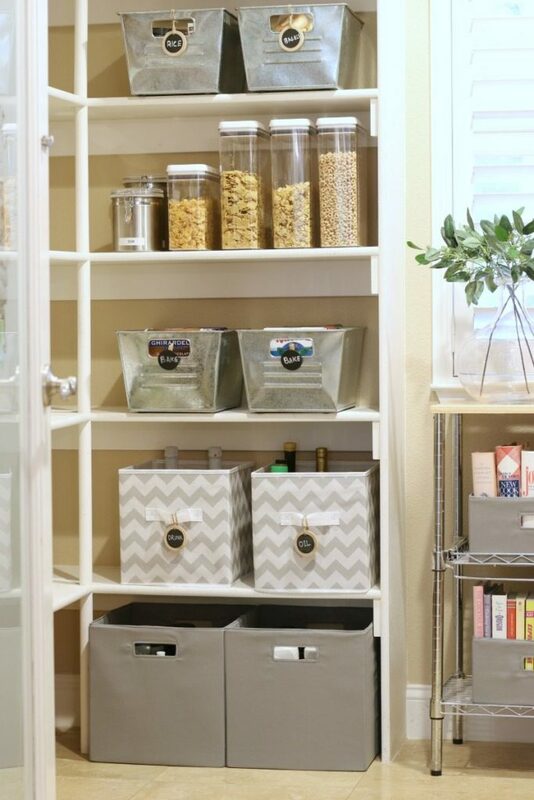 For more budget-friendly organizing solutions, visit the Better Homes and Gardens website! 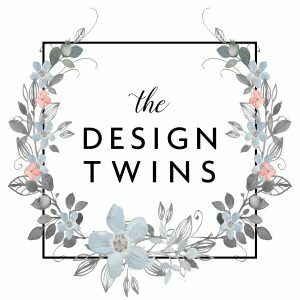 Follow The Design Twins tips, tricks and perfect product suggestions to create an organized pantry in 5 simple steps and even keep it that way! « Influencers, Want to know your worth and what to charge? I wish I had a pantry this size! I got a glimpse of your pantry door and love it. I had the same one in the home we moved from 7 years ago and I miss having that character. 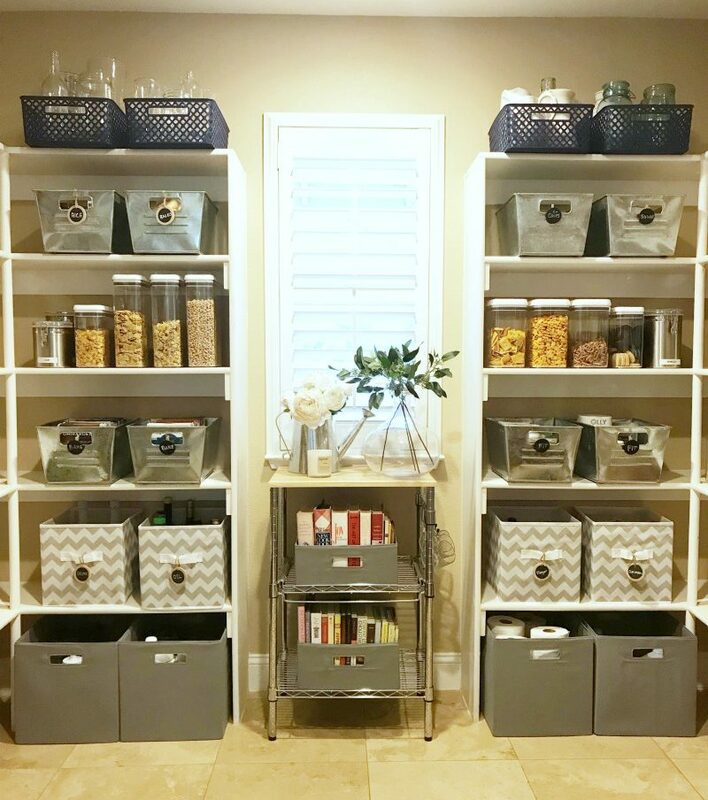 This makes me want to organize my current pantry which is just the closet under the stairs, but it is better than nothing! 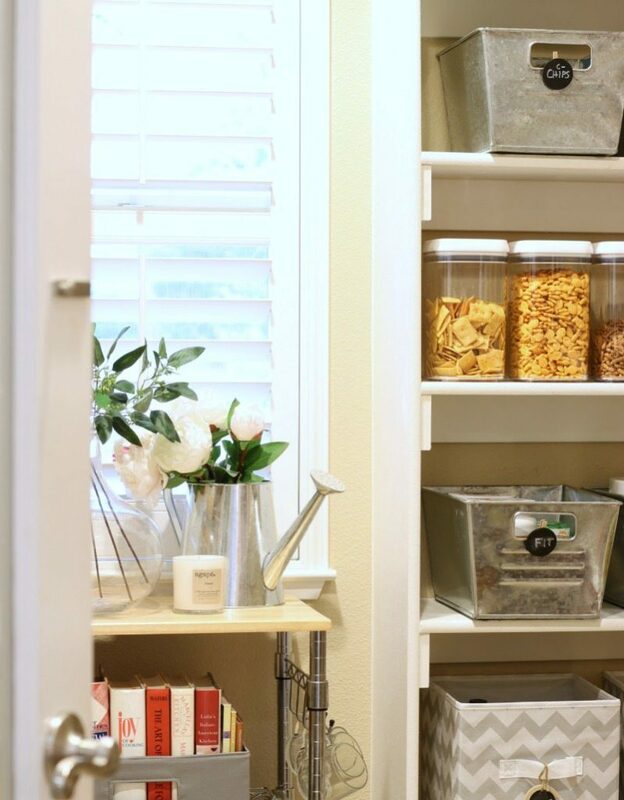 Your pantry looks fabulous! I am on a cleaning frenzy myself! 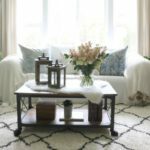 Great tips and I love the space to make it pretty ???? Great tips that I’m definitely going to utilize. I love the idea of a fun print wall paper. I been working on my pantry recently too, and one thing I did was have installled a sensor light on a 60 second timer. It’s a game changer. I love it so much I put one in the kids bathroom and the garage too! ???????? 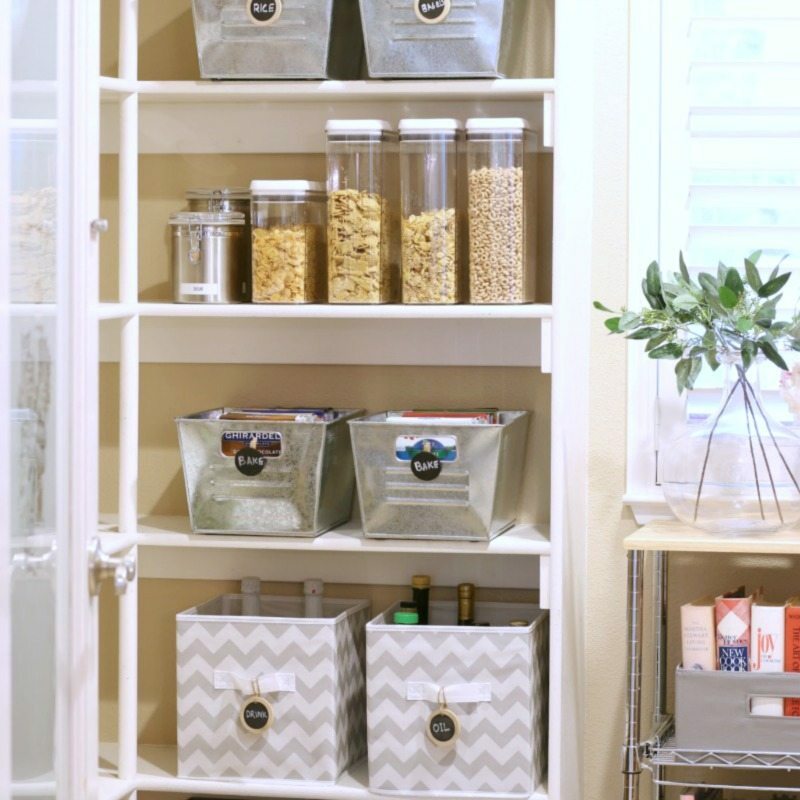 Your pantry looks amazing! I never thought of putting all the bottles (olive oils etc) in a bin, but that makes total sense – the one you want is always way in the back! I am definitely going to try that. My pantry is in desperate need of organizing and I can’t wait to do it. Thanks for sharing! This is a nice post. 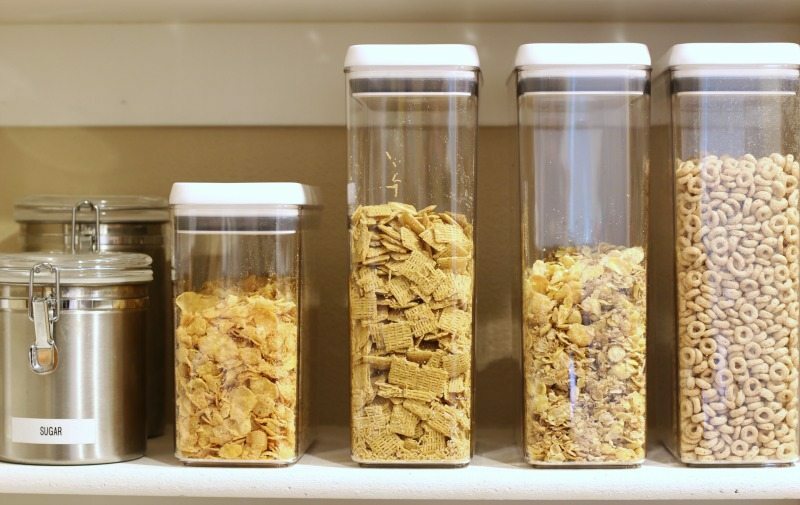 Thanks for sharing these simple tricks and tips for an organized pantry. Wow stunning space! Would love to convert my laundry room into an over-flow pantry space. Been wanting to incorporate white simple shelving like this. Did you build or buy these? I love your organization skills!